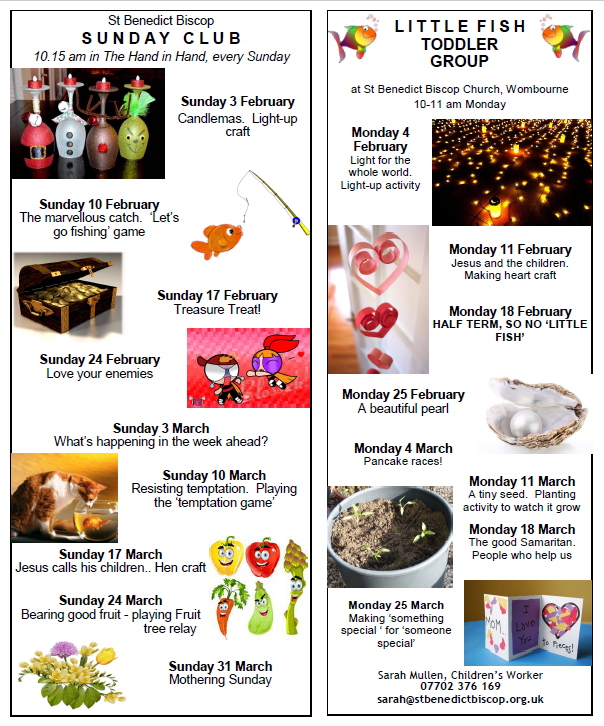 The information below takes you on a tour of St Benedict’s. A separate photo galley is also available here. In addition, a Floor Plan of the church is available which can be used with the tour below. Records show that a church has existed on the present site for more than a thousand years and the current one is dedicated to the Northumberland scholar, St Benedict Biscop -the only one to do so in the UK. 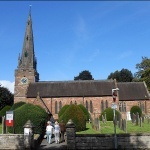 The building lies at the centre of the large, attractive village of Wombourne (mentioned in the Domesday Book), within a conservation area and is the Parish Church. It is a Grade 2 listed building and serves the growing needs of a 16,000 strong community, acknowledged by Wikipedia as one the largest villages in the UK. Royal Courts of Justice in London, Street is recorded as having worked on 179 Anglican ecclesiastical buildings, throughout Great Britain. 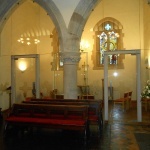 Entering by South Porch door, visitors see a large light interior , the central features including the altar at the eastern end of Chancel and the pulpit, with the font and its oak spire shaped canopy, near the porch door. 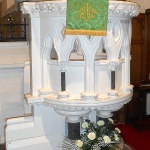 The font is early 19th century and situated by the main entrance reminds people that baptism is the way we all enter the church and thereby the body of Christ. 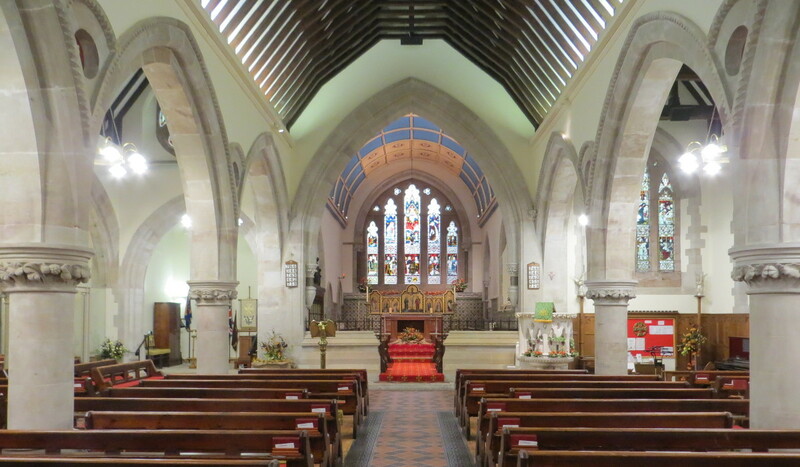 It is made from sandstone, in a Gothic revival style and is possibly the only fitting remaining from the time that the church was rebuilt in 1840. The oak spire shaped canopy (1905), protects the holy water from dirt and dust. 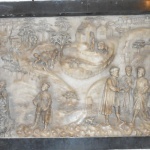 On the south aisle wall, by the porch is a late medieval alabaster tablet showing the parable of the Good Samaritan. Well crafted it reminds us of a period when few people could read and write and who relied upon pictures in order to understand the scriptures. The tablet was donated in the late 19th century by Thomas Shaw Hellier, whose family were long term patrons of the church. Moving through the Nave we see an elaborate sandstone pulpit, supported on marble shafts, designed by George Street. The stiff leaf carving around the top edge is considered a masterpiece of Victorian art. Just under the carving is a Latin inscription which says “This is what we have restored for the Lord”. 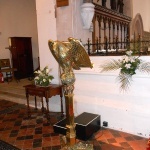 Placed near the division between the nave and chancel is a massive brass eagle lectern for the purpose of holding the bible at services, eagles having long been associated as symbols of strength and divine inspiration. The eagle has a snake in its talons, a reminder of how the word of God can triumph over evil. 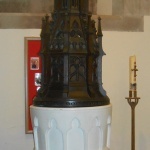 The lectern was given to the church in memory of Revd. William Heale, vicar from 1848 to 1897, who was instrumental in rebuilding of the church, Vicarage and School in the latter half of the 19th century. 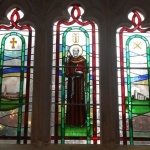 Our patron St Benedict is also patron saint of glass makers and we are blessed with a large number and variety of stained glass windows, most of which is Victorian, the earliest by Clayton and Bell, showing events in the life of Jesus. The great east window shows the Resurrection and Ascension and the window at the east end on the south aisle shows the events of Jesus’ Passion. 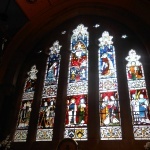 The seven windows in the nave are by the renowned Victorian stained glass window maker C E Kempe and his partner W Tower – all show a variety of saints clothed in splendid fabrics, a complete contrast with their earthly lives. An eighth window by Kempe showing The Annunciation is almost hidden from view in the base of the tower. Kempe signed his work with various monograms and three can be found in our windows, the earliest of which is three wheat sheaves in a red shield. 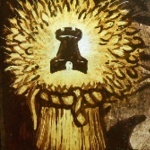 The most famous monogram is a single wheat sheave and the most recent a wheat sheave and a tower , reminding us that W Tower became his work partner, towards the end of his life. 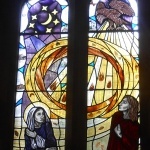 The Lady Chapel contains two new windows by Graham Chaplin of Hednesford Stained Glass, to celebrate the Millennium and shows the activity of the Holy Spirit at both the Annunciation and the day of Pentecost. 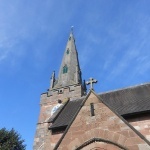 The design also incorporates all of Wombourne’s churches and also some symbols of the villages’ history e.g. the Staffordshire knot and nails (it once being a centre for nail manufacture). Our most recent window is the St Benedict window, located at the west end of the north aisle, showing him with the church of St Peter, Wearmouth (his first church), together with our own village church. 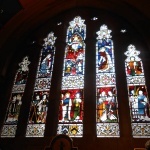 All of the symbols on the window are associated with St Benedict – BB in celtic script, the Celtic cross from St Peter’s, Trowel (builder of churches), Chained book (library St Benedict brought from Rome, Grozing iron (tool used by stained glass makers) and a knotted rope (a monk). Between the arches of nave arcade are six roundels, reminding us of Jesus’ passion and crucifixion – three bags of money (30 pieces of silver paid to Judas for his treachery), a crown of thorns (mocked by soldiers as King), flail (39 lashes ordered by Pilate), the pincers/hammer and nails(barbaric way Jesus was nailed to the cross), the sponge (used by soldier to satisfy Jesus’ thirst), the spear used to test if Jesus was dead, the dice (soldiers rolled dice to see who would get Jesus’ robe). 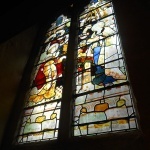 The stained glass at east end of south aisle also tells the story of Jesus’ passion, death and resurrection. 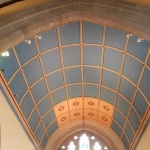 When Street rebuilt the church in 1867 he wanted the Chancel to reflect a little bit of heaven for those receiving communion . 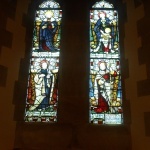 See also the Minton wall tiles, the east window and triptych – the latter made to Street’s design and made by Clayton and Bell in the 1870’s – it tells the story of the Christian Church and its two doctrines of the crucifixion (centre) and incarnation. 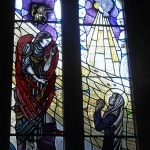 Whilst on far right and left the archangel Gabriel visits Mary. Mary is overshadowed by the Holy Spirit. The east window, behind the altar (an early work by Clayton and Bell), depicts Christ as king, reigning in heaven. The window has unfortunately lost much of its original detail, but it is still possible to make out St Christopher carrying the Christ child (towards top of left hand lancet), St Stephan (first Christian martyr, complete with the stone used to kill him (bottom of right hand lancet), St Peter with his keys, St John with his chalice (lower central panel), flanked by our four patron saints – Andrew, George, David and Patrick. It is still possible to make out St Patrick standing on some snakes – a reminder of the legend that he drove all the snakes out of the Emerald Isle. 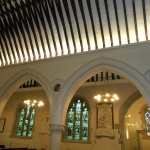 The Lady Chapel – completely refurbished in 2006 – provides a peaceful place for personal prayer and is where morning and evening prayers are said daily. A main feature of the Lady Chapel is the glass screen designed by Andrew Arroll, specially made to fit around the central pillar. The engraved panels are of two Celtic crosses and representations of the four gospel writers (taken from the Lindisfarne Gospels and reproduced by permission of the British Library) – St Mark is the lion, St John the eagle, St Luke the ox and St Matthew the angel. 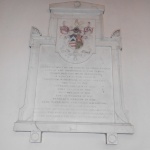 On the north wall of the church is a large marble memorial to Richard Bayley Marsh, of Lloyd House, who died in 1820. 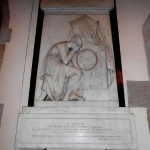 It is by the famous Victorian sculptor Francis Chantrey and includes a portrait miniature of Richard, expressing the grief that his widow felt at his death. On the same wall is another large memorial to the Shaw Hellier family – the snake biting its own tail is a symbol of immortality. The Shaw-Hellier family lived at the Wombourne Wodehouse and were long time patrons of the church and have subsequently been followed by the Phillips family, John Phillips being a nephew of the Shaw_Helliers. 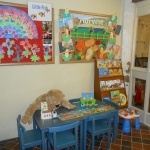 The base of the tower was until a short time ago used as the choir vestry, but following recent alterations it is now used by parents and young children as a play area, should they become restless during a service. 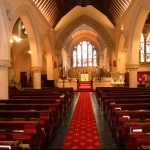 As it looks directly out onto the main body of the church it allows those accompanying the children to still observe and hear what is going on during the service. From this area it is also possible to gain restricted access to the stairs leading to the ringing chamber, the church having a light ring of eight bells, six were cast in 1744 by Henry Bagley and a further two trebles were added in 1890. The trebles were recast when the bells were re-hung in a new frame in 1996. The church itself stands in a large churchyard, the most ancient part of which lies to the south. The south face of the tower has a wonderful medieval waterspout, in the form of a gargoyle, having a contorted face – a reminder of the perils of staying outside the church. The lower north nave wall is one of the remaining parts of the church retained by Street when he rebuilt it in 1865. Here the irregular medieval stones contrast with the regularity of the Victorian masonry. Traces also remain of the medieval widow tracery. Looking to the tower, the spire is topped with a weather vane in the form of a cockerel, which replaced the original (and much heavier) dragon. In terms of records, our churches registers start in 1570 and provide a fascinating record of the life of our village over more than four centuries. 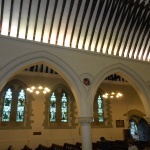 Only the most recent records are kept in the church, all the others are in the custodianship of Staffordshire County Records Office, where they can be viewed by prior arrangement. 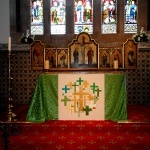 As part of the Millennium celebrations the parishioners and their friends undertook a project to replace all of the kneelers in the church, which now show a wealth of Christian symbols, local scenes and various flora and fauna. 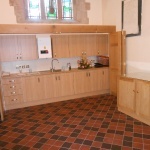 Recent work has involved the installation of a toilet, choir vestry/meeting room, Rectors vestry, repositioning of the organ chamber and retiling the floor of the nave. A hospitality point has been created at the rear of church, which opens up to provide warm drinks and light snacks. Handicapped access has been greatly improved during the recent building work. It is hoped that the tiling will be completed in 2017, together with the installation of inner glass doors in the porch and some stone work repair.